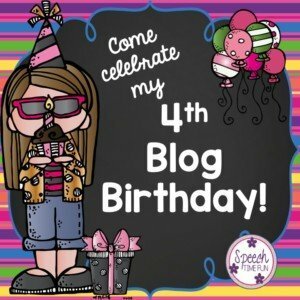 I cannot believe I have been blogging for 4 years! When I started Speech Time Fun, I wanted to just have a diary of my therapy ideas. I had NO idea that people would actually read it! Here I am, 4 years later, I’ve been featured in various websites/publications, I have been a part of an exhibit booth at ASHA with 14 other FABULOUS SLP bloggers, got to take a tour and meet the TpT staff at headquarters, and still going strong! I owe everything to YOU, you read, you follow me on social media, and YOU keep me motivated to continue. 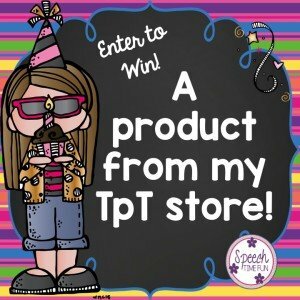 To thank you for being YOU, I am going to hold a giveaway so that 4 people can win a free product from my TpT store (valued up to $5)! 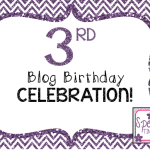 I cannot wait to see what this year will hold and what I can accomplish with this little blog! What are some of my plans/goals? I cannot wait to get started! Enter to win below! 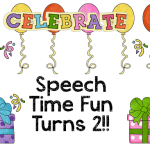 Thanks again for reading my blog and for loving Speech Time Fun as much as I do! 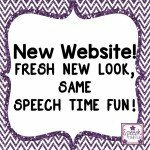 It really is just so much fun and I love blogging about anything and everything speech! 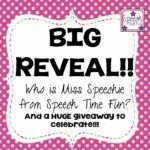 Want to read about how I celebrated Speech Time Fun’s third birthday? 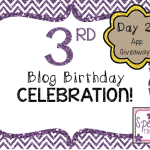 Check out this post!